Incan Gold (co-designed by Alan R. Moon, designer of Ticket to Ride) is a quick, fun game of bluff and daring in which explorers push their luck while exploring an old Incan temple in search of gold and treasure. In each round, you decide whether to delve deeper into the temple, adding to your riches, or escape with the share you’ve acquired so far. This is a sort of hidden gem, and a great filler game. You can teach a new player in a couple minutes, and play an entire game in 15-20… Of course, then you have to play a second, and a third, and a… But I digress. Incan Gold will remind you of that old “Press Your Luck” game show, where you’re trying to make as much money as possible before something wipes you out. In this case, that “something” is one of a number of trap cards that can appear as you’re exploring the ruins. Of course, you don’t want to leave the same time as everyone else, as any gems on the board are divided between the people turning back, and you can only collect an artifact if you leave alone. So in essence, you’re taking your chances against the deck, while also trying to read your opponents. There’s a substantial amount of luck, and a bad draw CAN make a round somewhat disappointing. Adding more players shifts the emphasis more toward reading your opponents, due to the way gems are distributed. Incan Gold is one of my favorite boardgame designs. It’s plays quickly, both in total time, and time per decision. It accommodates up to 8 players, and plays better with a larger crowd. The rules are extremely easy to learn (and teach! ), and best of all, it’s fun. It is (along with For Sale), my go to “filler” game. You’re an explorer, trying to get as much treasure as you can out of an old temple. During the game, you have only two decisions to make, and you’ll keep making them over an over. Do you stay in the temple, or do you run back to your tent? While this may sound like it’ll wear out its welcome quickly, the risk/reward element of the game keeps is exciting. It doesn’t feel as though you are just playing against the other players, you’re up against the temple itself, dragging as much treasure as you can from its trap-filled halls. The game is played over five rounds. Each round, a path of cards will be flipped over, one at a time. The card will be a treasure card, a hazard, or an artifact. After each card is revealed players will secretly choose whether they want to continue on, or leave the temple. Once you leave, you are out for that round, but will be back for future rounds. Leaving ensures that all gems you’ve collected this round are “safe”, they are put under your tent and will count towards your final score. When a treasure card appears (15 total), it will show a number of gems from 1 to 17. You’ll divide the gems as evenly as possible among the players remaining in the temple, leaving any remainder on the card. The collected gems go in front of a player’s tent, not under it. They are at risk, with leaving the temple the only way to ensure you’ll score them at game end. When people choose to leave the temple, they collect any gems left on the trail (dividing evenly if multiple people leave). There are five types of hazards, with three of each in the deck. If one of a given type comes up, nothing special happens; it just means it is more dangerous to proceed. If a matching hazard is ever drawn, the round ends and anyone remaining in the temple loses all gems they would have collected this turn. The round will also end is all players have chosen to leave the temple. The final cards are artifacts. Each round, one is added to the deck. If they ever appear, a gem worth 5 is placed on it (15 if it is the 4th or 5th to be seen). An artifact can only be grabbed if you are the only player to run back to your tent in a given turn. If no one gets an artifact before the round ends, it is removed from the game. Following the fifth round, count all gems under player’s tents. The player with the most gems wins! (If your game is like many of mine, you’ll then reset the game and play again). I am very pleased Incan Gold is in my collection. It fills a spot as a quick filler, a large group game, and a game to use with non-gamers. The easy rules allow anyone to play the game, with the decisions coming from gambling on what the next card to come up will be. While people are interested in the final score (as opposed to Dixit, where I often find players don’t care about who won), they enjoy the game whether they win or lose. It’s slightly easier to teach than For Sale (and quicker to setup), though it doesn’t have quite the same depth. I have heard from a number of players that the cards used to show whether they are continuing on or leaving for their tent are confusing. I have not run into this problem when playing (the card for leaving shows your tent), but have heard it enough times to find it worth mentioning here. I now stress when teaching the rules that it’s very likely someone will choose the wrong card at some point in the game. Usually with that warning, people pay more attention to which card is which, and it’s less of an issue. I like the use of cards to make the tents, but I know some players aren’t thrilled with them, thinking they’re too small and look somewhat cheap. I feel the quality and look of the gems more than makes up for any deficiencies posed by your tents, which do a good enough job of keeping scores hidden. If you’re a fan of risk/reward and push your luck mechanics, or just looking for a quick game that’ll play a large group, Incan Gold could very well be for you. I’m a fan, and I hope you are too! I bought this game for two reasons, based on the reviews below and on video reviews. First, I wanted a simple filler game that didn’t require much strategy but was fun and quick. Second, I wanted a game that would be fun with a small group of 2-3 and a large group of 8. The basic victory condition is to have the most gems at the end of 5 rounds of play. The path to victory lies in exploring the creepy temple and avoiding traps while picking up every gem that lies in your path. The fun starts when you all simultaneously vote to either go deeper into the temple or decide to take your gems and scurry back to the safety of camp. If you go deeper flip a card over and it can be either a fixed number of gems that you split evenly with other brave explorers, a trap card that shakes your nerves a bit unless it is the second trap of the same kind which scares you from the temple causing you to drop all your loot and return to camp empty handed, or finally it could be a valuable artifact. For those brave adventures that continue to explore great treasure awaits but also danger lurks around every corner as traps are quite common. For those that are more sensible and know when to get while the getting is good you can snag a few extra gems that were left on the ground as the exploration party went deeper, and if your the only one to head back to camp you get any artifacts that were along the path. But if your party are a bunch of cowards or greedy sneak thieves who turn back in a group no one gets the left over gems or artifacts. This game is great no matter the group size, it plays quick since it is a simultaneous turn and the 5 rounds are fast. You hide your gems in your tent so that no one else can see the fortune you’ve amassed. At the end of the 5th round you count up all your loot and someone is declared the winner. I would recommend this game to all ages, it is simple to teach and fun to play. This is the game that got me into tabletop gaming. My friend brought it out and I was skeptical at first but after the 2nd round, I was hooked. And that is exactly how easy it is to learn this game. Everyone wants to win a lot of riches and this is the game that really puts the players in that situation. The thematic element is very simple but if the person explaining rules does a good enough job, he/she can really get the players into character and by doing that, they will be really invested into being the one that comes out with all the riches. It is almost like gambling at the casino except it is fun and less stressful. Well, it can be stressful depending on how invested you are into the game but in my gaming group, we had cheering, laughing and some groaning. Ok, lots of groaning but it was mainly because some people were too greedy. I love this game. It is a game that really helps non-gamers get into the competitive spirit. It is easy to learn and most importantly it is quick and fun. It doesn’t take a long time to set up and it is something that anyone can learn quite quickly. 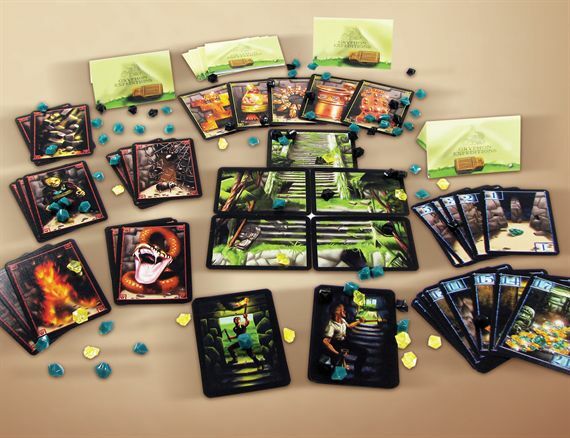 Incan Gold is a Press-Your-Luck game where you reveal cards from a deck which either have gems on them, Treasures, or hazards. After each card, players secretly decide if they wish to leave or press their luck. If you leave, you split all the gems currently in the mine with all players leaving that round. If you stay, you get nothing, but you may continue on. The treasures are worth 5 or 10 gems each, but you can only claim a treasure if you are the only player to leave the mine that turn. They are never split. There are 5 hazards, and two identical hazards will end the round, with all remaining players receiving nothing. After a hazard causes a round to end, one card of that type is removed from the deck, it is reshuffled, and another is played, for a total of 5 rounds. It’s a fun little game, very quick to play, and involves a good deal of bluffing your friends and risking your shiny gems. The components are nice, but I knocked a few points off because they have you bend cards in half to form tents to hide your gems, and the cards get worn and weak from repeated bending fairly quickly. Originally released as Diamant, Incan Gold is a re-implementation of the same theme and mechanics with a few different cards added. Incan Gold, as you might’ve guessed, is set in a South American temple, with the players as explorers seeking rare treasures. It’s a push-your-luck game, with the explorers having the option to return to camp with the treasures they have found or continue on further into the temple. The risk factor comes in the form of various hazards such as poisonous snakes, cave-ins, and even weird, creepy lookin’ zombies. Once you come upon the same hazard twice, everyone still in the temple is set off runnin’ back to camp scared out of their wits and leaving all their treasures. It sure hurts to have accumulated a nice sum of gems worth a hefty amount of points, especially when someone’s already returned to their camp with a respectable sum themselves. Incan Gold also adds an element of bluffing that Diamant presumably didn’t have in the form of Artifacts. Each level of the temple has an artifact that’s shuffled into the deck. Each artifact is worth a good chunk of points, but only one person gets it. If more than one explorer leaves at the same time, nobody gets the artifact. The mind games really add a lot of fun to the game as it puts even more weight on the decisions the players make. Incan Gold plays very fast, always five rounds, and you’ll probably find yourself wanting to play multiple games in a row. Granted, this is no deep strategy game, but a part of me absolutely loves quick, simple, streamlined games. With all the 90-180 minute eurogames out there, sometimes you want a quick game where anyone can win, yet isn’t completely chance. I really like this game. The only thing I didn’t like was that the components seemed a little ‘cheap’, but overall, it’s a great little game. I just picked this game up via trade. We played it last night for the first time. It was an instant hit. We played the game 4 times. This is a classic press your luck game. Keep going to get more treasure, or leave now and keep what you gained. Great game. It’s short, easy to learn, and a theme that most people can get into. The price is also right, running about $25. Add a Review for "Incan Gold"